Seasonal, religious, and retail — November-January is packed with events and traditions that people will be discussing on Twitter. For some of these celebrations, you'll want to join the conversation, run promotions, or create full marketing plans. With 70% of US shoppers beginning their shopping before December 2nd*, businesses can benefit from advertising early. And the first step to marketing big and small is to know the day is coming. 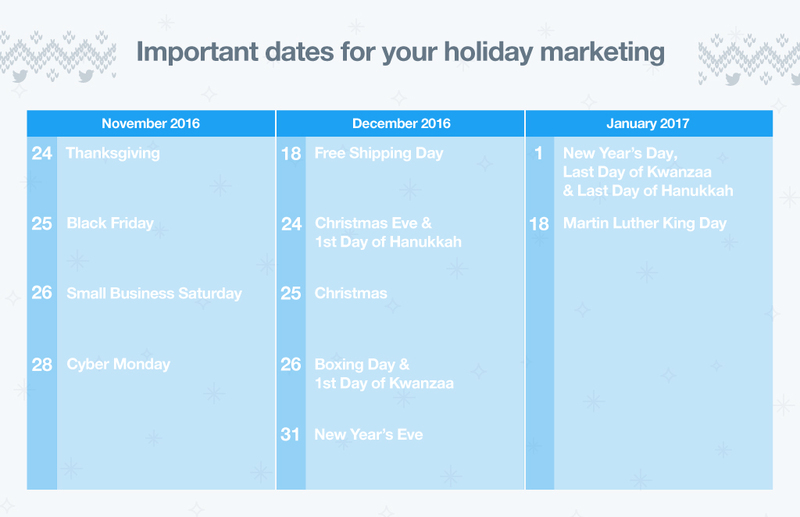 Make note of these important dates, and download our holiday marketing calendar to plan your Twitter campaigns today. Ready to get started? Create your own campaign, or take a look at our Twitter Ads basics to learn a little more.